We read that St Gemma was a “victim soul”, but what exactly does this mean? 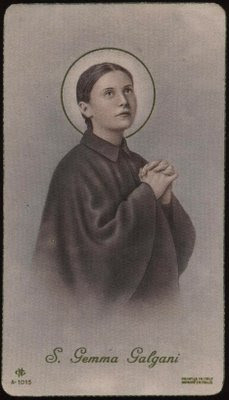 Having read the lives of numerous mystics, the one’s that I have found most interesting are the “victim souls”, like St Faustina Kowalska, St (Padre) Pio of Pietrelcina, Therese Neumann, Blessed Alexandrina Maria da Costa, Marie Rose Ferron, Marthe Robin and finally my favorite and the subject of this website, St Gemma Galgani. In the reading of these lives, I have caught glimpses of this great mystery of a “victim soul”. It is something that has always struck me, an explanation of which I will try to share in this article. It should be noted however, that I am not a theologian in any sense of the term, so I will try to avoid wading too deep into mystical and theological waters, of which I am not equipped or gifted. “I have been crucified with Christ; and it is no longer I who live, but Christ who lives in me." (Galations 2:20). “Now I rejoice in my sufferings for your sake, and in my flesh I complete what is lacking in Christ's sufferings for the sake of his body, that is, the church. "(Colossians 1:24). It is in this sense that the victim souls cooperate with Jesus in reparation for the sins of humanity and also for the conversion of sinners. And it is also in this sense that we too are called to make reparation, to the extent that God wills, not only for our own personal sins, but also for the conversion of sinners. Thus, we are all called to be co redeemers with Christ, to the extent of God’s will and plan for each of us. The close union of Jesus with His victim souls is essential for the accomplishment of the reparation and redemption that He desires through them. It requires their free cooperation not only with His grace, but their complete abandonment to His holy Will. As I mentioned earlier, Jesus it seems, is not only with them, He is in them. And it is precisely through this close union with Jesus that the reparation and co redemption is accomplished through the sacrifices and in the sufferings of the victim soul. 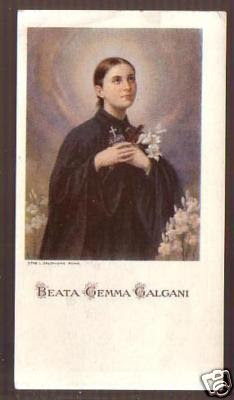 Thus Saint Gemma, for example, in union with the Passion of Jesus, suffered at times the stigmata, the scourgings, the crown of thorns etc. on Thursday evenings into Friday afternoons, that is, the time period that Jesus suffered in the Garden of Gethsemane until His death on the Cross at 3pm on Good Friday. It is precisely through this close association of the mystic with Jesus’ suffering that the accomplishment of the reparation is made. "Jesus knows of my disposition to suffer everything to make reparation for my sins. He sees once again the pain I feel at all my ingratitude and also the pain I suffer when I see Him so mistreated. On Friday then I propose to do this: with a contrite heart I will go in front of Jesus ready to receive from His hand anything that will please Him in reparation for the many outrages that He receives. Strike me; strike me Jesus. I will bless a million times the hand that will exert upon me a most just chastisement. So dear Dad, I ask Jesus to have me suffer; and to suffer much..."
And so, there we have an explanation and description of the special vocation of victim soul. For those interested, here is an excellent article on the Virgin Mary's role in the lives of the Victim Souls and their battle against the demons. The article is based on the booklet "Mary Crushes the Serpent." I would like to answer why God needs "victim souls". It is easy for people to have faith when times are good; it is when times are bad that our faith wavers. So when a victim soul, in the depth of suffering still manifests faith, is this not inspiring? Doesn't this show what is possible? And when a victim soul remains loving and compassionate, doesn't this inspire us to rise above bitterness and anger when we find ourselves victims? To the conservative minded person, nobody really wants to play around, unless your boss sends you someone else for you to be with! Most of the time, everything about ME is to do with business and politics of the company which I work with. I don't have anything against the church thinking. Most churches leave the audience alone, unless the priest are told to be aware of your presence in the pews. To me, it is not for me to condemn anyone, and it is not for me to say that YOU are a sinner. In New York, I happen to have a very loud voice as approved by the people whom I work for. Everything I do have a reason. Each person must examine their own comfort levels and job description. Love is good, but I need to be faithful to only the person who request me to do so for HIM/HER. The Lord calls those who are victim souls to suffer out of love. This is very important- that love is the reason. There are so many souls who chose terrible evils and have hardened hearts to God. Imagine a mother who has a sick child and would give anythign to take on that pain herself so that her child need not suffer. It is out of love that the offering is made. God is love, but He is also justice. We see this clearly in the gospels. 1)The Church does not "push" anger, pain nor suffering. It recognizes it as a consequence of original sin. 2) While you are correct that "Church...is not needed to know what is right" , "rightness" that is, truth, is not subjective, it is objective, and its source is God. This is why Jesus said "I am the way, the *truth* and the life." And as far as God needing suffering, pain and blood -well, one can contemplate Jesus passion and death on the cross and realize that reparation was needed for our sins. “I have been crucified with Christ; and it is no longer I who live, but Christ who lives in me." Did you bother to read the text prior to and after that passage? It is clear that Paul (speaking to the Galatians) is NOT talking about suffering in the name of Christ but that by Christ’s ultimate sacrifice and suffering we are now one with Christ Jesus and by accepting him into our hearts, He can act through us. Your other quote from Colossians 1:24 “Now I rejoice in my sufferings for your sake, and in my flesh I complete what is lacking in Christ's sufferings for the sake of his body, that is, the church." Is taken WAY OUT OF CONTEXT! The only thing about this passage that can be used is that Paul does suffer for Christ. But not in the same way as you are trying to justify it. You would have people believe that Paul is suffering in the name of Christ by taking on the sins of humanity as Christ did. This is by definition what you call a “victim soul”. However, Paul’s suffering comes from preaching the word of God. His suffering is his imprisonment. Paul never makes the mistake of comparing his suffering to that of Christ Jesus. He never states he takes on the sins of the world as Jesus did and suffers alongside Christ. Paul accepts his suffering (imprisonment) because he believes in Jesus and that Jesus is the one true God who by his suffering and death took away the sins of the world. You need to stop preaching that “victim souls” exist and that Jesus needs them. Jesus needs no help and God is not angry with us like you believe. Sure he might be greatly disappointed with us but all our sins are forgiven because of Jesus. To say He requires “victim souls” goes against the bible and therefore goes against the word of God. Otherwise, by your words, God lied when he made His covenant with us. And I for one have no desire to worship a lying god. “Victim souls” do not exist and are not required by God. A “victim soul” would still be a sinner and therefore useless to the world. If someone wants to suffer for his/her sins then so be it. I’m not one to stop them. But to claim they are suffering on my behalf is just plain stupidity. A sinner cannot suffer for anyone but themselves. Patrick I am sorry but you are the one misunderstanding what Paul was trying to teach the gal. 1st you are right in that Jesus does not need us to suffer to pay/redeem mankind, but where you are wrong is in the twisting of this statement to your own feelings. God loves us so and knows that those that truly love him want to help in anyway they can even though they know they are worthless ash and unworthy of any kind of attention from God, but the love we have for Jesus is so great that we cannot help ourselves we want to do something to help, so Jesus out of love and his generosity lets us suffer some of his agony to take to ourselves some of the suffering that others go through and to help those who are suffering in purgatory. And even that small amount is to much for us most days and we cry for help or relief because we are so weak and worthless. You are correct we cannot redeem anyone by ourselves but Jesus in his mercy will let us help because he loves us ans we him.. Victim souls do exist. In fact Jesus was one of them. All suffering brings us closer to God and as the Lord said, we must take up our crosses and follow him. He did not say that we do not need to suffer because he did it all for us, rathe he asked us to take up our crosses so we can unite our suffering with his. Suffering has no value unless it is united with his suffering on the cross. When we suffer for Him it has great value. We all suffer in any case. whether we believe or not, because it is the will of God. No one escapes suffering and death. Correct understanding of suffering means accepting it with love in agreement with the Will of the Father. We need to accept is just as we accept the joy he sends us in our lives...all for Love of Him and to his Glory. The idea of "victim souls" does indeed sound harsh. It almost sounds as if God is harsh and cruel. This, though is the gift of our truly loving God: to be worthy to suffer in union with Christ. Elisa Rose gave an opinion about not understanding "why a loving God would need victims in the first place". She goes on to say that "Patience, Tolerance and Understanding are a part of my daily practice. This is I believe, what Stephanie meant by the church needing compassionate people and not vindictive ones." It is folly to fall on emotional interpretation. The concept of a person assisting in carrying a burden is not alien to love. And while Christ has redeemed mankind, sin and it's effects remain. Suffering is a gift that we all share. Martyrdom is part of Christian history. That Christ would choose to have some participate in sacrificing themselves in a particularly close way with Him, is a blessing and not a curse of a sick twisted god. Thanks Joanne for your excellent comments and for sharing your insightful reflections. I have been told that as a gay man my "calling" is to offer the sacrifice of my love life to God as a victim soul. In other words, I was created to feel the need for love and partnership, but never to have them. That I feel the need for love and partnership can't be denied. But that God created me never to have them is something I'm unwilling to accept. Why me? If I am a victim soul, I'm a most unwilling one. Not only does the concept test my faith, it really just makes me want to lay down and die. I get no pleasure from the prospect of dragging out my days in celibate loneliness. And what kind of a God would require this from me? The cruelty and randomness of it all speak to me of callousness and amorality rather than love and mercy. The willing victim soul is of course free to choose such a fate. But the unwilling victim soul has just as much right to reject it, I believe. Thanks for your sincere and heartfelt comments. When it comes to each one of us, without a doubt the most important thing to God is to one day be united with Him in heaven for all eternity and using the gifts of our intelligence and our own free will, we are to work out our salvation. He bestows grace and wisdom upon us, along with the necessary strength to accomplish His will and desire for us--and we receive His grace most especially when we are sincere in our desire to know, love and serve Him, and we do this firstly and most importantly by obeying His commandments. As far as the subject of homosexual desires, I leave it to Jesus to help and guide you in your struggle in this area, since I am simply a layman, and am not in a position to advise on such a matter. I am a victim soul. It is not easy. I need prayers. So far I am not doing well. The temptations are very strong. But I have faith and love for Jesus. He is all merciful. The devil talks to me. He is so evil and he uses every tactic he can against the victim because he knows the victims weaknesses. One must make many sacrifices and resist temptations. I need prayers very much so if anyone is reading this, please pray for me. I do not have long to live. Patrick is certainly correct. Anyone who has had an extended near death experience will confirm that the Divine, or Source, is pure unconditional love, without a trace of anger, blame, or any of the human qualities we in our ignorance project upon the Ineffable. THis only leads me to conclude that those who imagine themselves to be victim souls are simply superimposing their own religious conditioning onto experience, and in a sense are hallucinating. Moreover, they make themselves the subject of all this supposed victimization, which is very telling, since the true mystics are the ones humble enough to let go of any personal claims, whether it be of personalized visions or special conversations with some imaginary supernatural entity. Anonymous... we are the followers of Christ and so we are called to follow in His bloody footstep. He died to save and redeem fallen Mankind. Victim souls simply follow in His footsteps, adoring God and loving Him so deeply they find the fulfillment and deep relationship with Him that many do not. "Oh that today you would listen to His words harden not your hearts." Love yes love is good but without suffering how can anyone understand real love. Love that gives without counting the cost. I never would have believed a good God would make a victim soul until he made me one when I asked Him to let me serve others through Him. He chose my status as a martyr and victim soul and I DIDN'T WANT IT! But I cannot reject it, as He does not care that I don't want it. My intense faith -- KNOWING -- that the Lord's love was real and that He could help me help others is why I vowed to serve. He was impressed with that total faith and gave me this "gift" (unbearable burden). I suffer still even when I got to my breaking point and rebelled against His decision. Ironically, I hate the existence of suffering and my dream was to help end the suffering of others (I was very happy before he martyred me). I hate this, but God keeps telling me the word "test." It's a test. Please pray for me, for it is a very real phenomenon, and His victim souls and martyrs and Saints are not always willing objects of his painful puppetry. He used my body as if I were a puppet to show how little control we really have -- it's an illusion. What a shock! I thought we had total free will, but we are all interconnected in ways we do not understand, and what happens to us is not always the randomness of quantum physics rattling around in us and going up the chain to macro-scale physics to create something tangible -- it is Him who can use us in any way He chooses. It frightens me greatly and I would not have chosen this path. Please pray for my redemption and to be freed of my suffering for eternity as soon as possible. When I became a victim soul at 30, my sufferings hurt my mother greatly as well, something for which I resent God to be honest. I beseech you all to pray for me now but also regularly if you can, please remember me, please pray for some respite for the agony I endure. It is a horrifying nightmare I could never fully explain to another human being. I just turned 33 a few days ago and I was originally set to die at this age, but because I was looking forward to it to end my suffering, He said I will live a long life of this agony instead. I cannot kill myself because it would compound my suffering and "make my journey harder," according to Him. I beseech you for your prayers. Something evil torments me when I try to pray the Lord's prayer or a Hail Mary. Praying the Rosary has always augmented the hell I was in. So I can no longer pray. Please help, someone -- other people's prayers have been the only things that gave me temporary respite. I thought about getting an exorcist I was in such agony! K I am just now reading this. It's 11/16/18. Are you still alive? What is your suffering exactly? I pray the rosary every day and I will include you in my next one tomorrow. I noticed no one commented after your lonely post. I heard you and I care.